We believe compliance to these principles has made us a leading manufacturer in our industry. 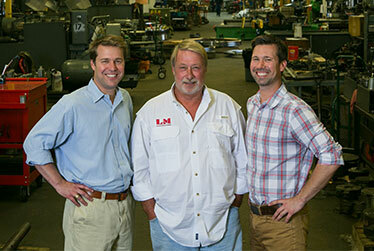 Lowrance Machine is a family owned company founded by Jesse J. Lowrance, Jr. in 1964. The value of hard work and commitment were ingrained in Jesse at an early age when he started his machining career in Houston. In addition to his full time job he worked late nights and weekends out of a garage to support his family. Over years of dedication, he crafted a successful reputation and was able to open the doors of Lowrance Machine. The current President of Lowrance Machine is Ron Lowrance, Jesse’s son. Ron has paved the way as a respected and innovative business owner. He has used his experience, expertise and passion for success that he learned from his father and has passed these along to his sons, Chris Lowrance and Matt Lowrance. Together, Ron, Chris and Matt use the experience of three generations to guide Lowrance Machine through today’s ever changing market place. The focus for Lowrance Machine has always been and will always be on building and maintaining lasting relationships with customers. Lowrance Machine is proud to be a company large enough to meet their customers’ growing needs, yet small enough to know them by name. They excel with the attention to service and detail of a small shop, but with the equipment, services and experience to tackle large projects. After 50 years in the business, they are a recognized leader in manufacturing molds and machined products specially made to meet your requirements. Please contact us with any questions or to receive more information about our capabilities.